First Nations peoples’ fires burnt the forest now known as the Michael Boyer Woodlot for centuries. The fires were likely used to provide room for the three sisters (squash, beans and corn), for spiritual ritual, and fostering community. European settlers’ plows and axes later ruptured the same earth, surrounding root systems and felled neighbouring trees to establish fields for cash crops. However, the forest maintained some of its original ecological and hydrological roles during the settlement and farming era. After the property was purchased from the Stong Family, the university started its rapid construction phase in the 1960s. This is the beginning of the Michael Boyer Woodlot narrative—a series of complex stories which cast the woodlot as a place of study and student refuge, an obstacle to development and a management unit. 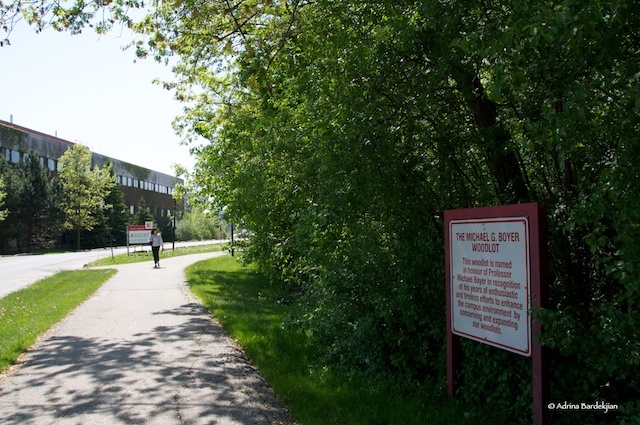 Named after a retired biology professor for his efforts to conserve green spaces on campus, the Michael G. Boyer Woodlot is one of four urban woodlots now formally recognized on the York University campus. It was the threats and damages to the woodlots that stirred Michael Boyer to come to their defense. The degradation came in waves: a sustained and balanced moisture- regime transformed into one of extreme spring floods and hot summer droughts; as a result, the soils shrank greatly and exposed feeder and buttress roots (Boyer et al. 1986); extensive construction across the campus forced the meadow voles that had lived in the agricultural fields to invade the woodlots causing extensive damage and wildlife displacement; and the increased traffic associated with the construction boom carried with it disease vectors that infected the trees and plants. 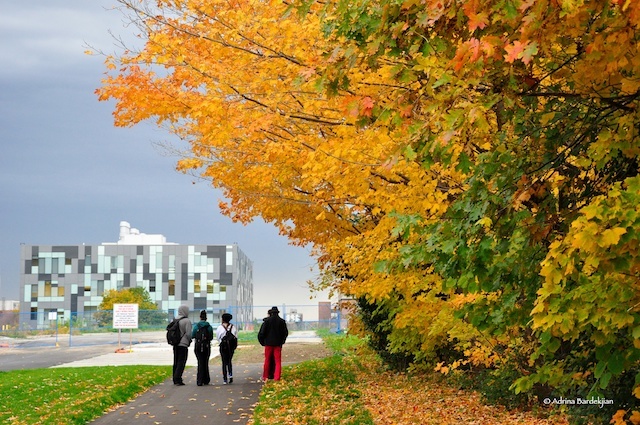 Ninety per cent of the elm trees on campus that lined many of the roads succumbed to Dutch Elm Disease. Boyer worked with the Arboretum Committee, an organization formed by maintenance crews and faculty members and sponsored by a senior administrator, to coordinate action to rehabilitate the four woodlots. The Ministry of Natural Resources also offered free planting stock that aided arbor and reforestation days and two extensions to the Boyer Woodlot (Landscape Inventory and Impact Study, York Campus, c. 1990, p. 84). 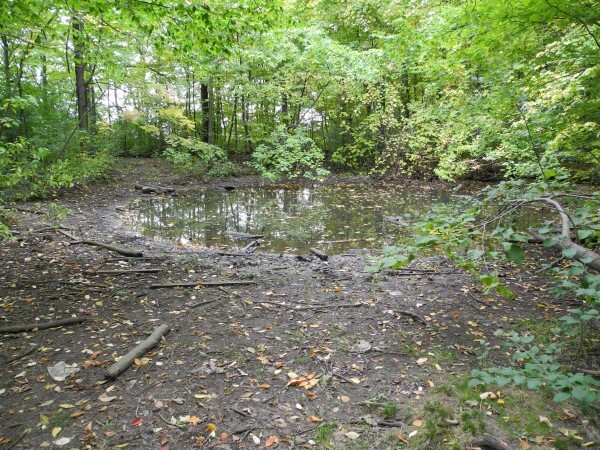 Since being named, the Boyer Woodlot retained a variety of trees and housed two ponds that served as resting places for migratory birds and as a key habitat for a colony of wood frogs. Today, the Woodlot is valued as a forest remnant with a species composition typical of the Great Lakes St. Lawrence forest zone. It contains over 30 different tree species, including Manitoba maple, sugar maple, white ash, ironwood, white pine, trembling aspen, red oak, black locust and white elm (York University Secondary Plan Update 2008). Like old friends waiting to be acknowledged, scientists give trees names and families from which they are borne. Although few visitors know these names, urban green spaces like the Michael Boyer Woodlot are places of social interaction, study and refuge. Such a narrative is rooted in personal and spiritual experiences tied to treed landscapes; they’re the foundation of human behaviour towards these places. For instance, many students view the woodlot as a social place to relax, practice yoga, smoke, drink, make out and even create art. For others it is a point of escape, an anarchic space where you hide from authority and do illicit things (in the tradition of Robin Hood). It is in some ways recognized as such both by people who throw garbage there and by officials who dump geese in there. It’s an intimate relationship that individuals share with this green place they call their own. Stephen King’s Pet Cemetery comes to life in testimonials from past students who have buried their furry friends in the soil strata; giving voice to the trees as living memorials. Another story bears witness to the personal significance of the woodlot as an escape for a foreign student who is unaccustomed to urban green spaces in his homeland of China. Conversely, to some campus visitors and dwellers, the woodlot does not constitute an escape. This is for good reason. Occasional robberies and rapes and even a recent murder on or close to the campus testify to the vulnerability of certain groups, especially women, at certain sites on the campus. 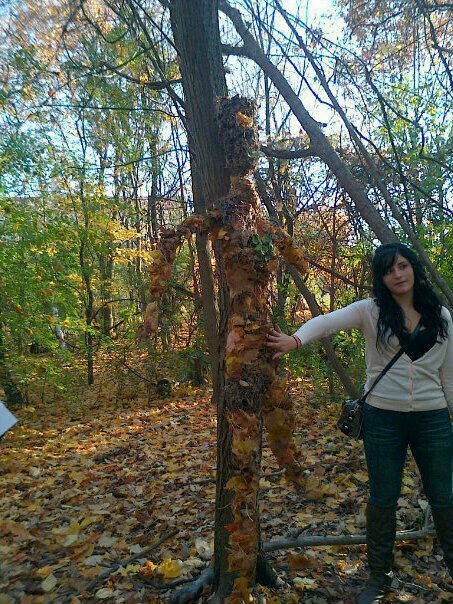 In one spot of the woodlot stands a leafy woman; an artistic expression stuffed of the forest’s fabric of leaves and chicken wire. This sculpture resonates with many visitors. It could be because some people like to see themselves made from the forest, like long ago; it could be because some believe that nature should be conquered or that they cannot relate to a natural space unless there is evidence or some semblance of humanity’s touch. Whatever the reason, here she hangs, suspended from a maple, stuffed with the diversity of leaves and twigs from her surrounding tree species. Almost twenty years ago, she was mutilated, stabbed through with long branches and emptied of her contents. A short time ago, though, students saved her; refastening and refilling her empty limbs. The camaraderie and sense of collaboration this evoked created yet another story. In fact, the woodlots may be some of the safest sites on campus. Yet some individuals intentionally avoid the interior due to a fear of the forest (Cronon, 1992; 1996) and the alleged imminent dangers lying within, opting for the longer way around. Forests can be complex social spaces that both attract and repel human beings. In addition to being a social place, the woodlot is also a place to learn. A total of 1,294 students use York University woodlots annually as a place of study, for coursework and research. Environmental Studies and Science courses such as Restoration Ecology, Conservation Biology, Applied Plant Ecology, Physical Geography, and Population Ecology have multiple uses for the woodlots during the term. They host an array of activities, including: conducting tree inventories, tracking birds and small mammals; sampling for species composition; examining patterns of snowcover distribution and melting patterns in woodlands versus open areas. 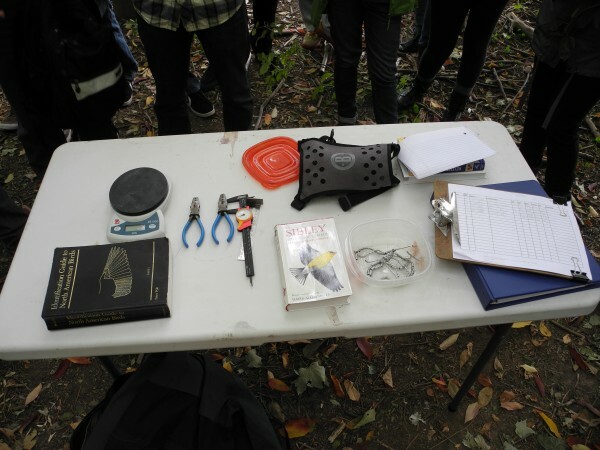 In the first weeks of October every year, a biology course takes a bird inventory. Towards the interior of the 5 acre plot, nets drape down from looming Ironwoods and Red oak in order to trap unassuming warblers and sparrows. 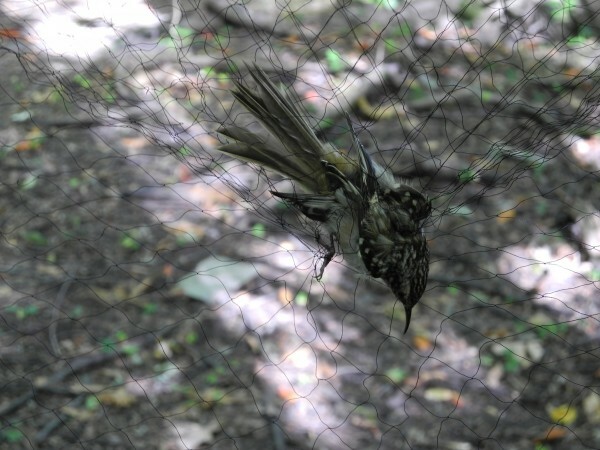 Careful hands untangle the trapped birds, measure them, band them, and then release them. 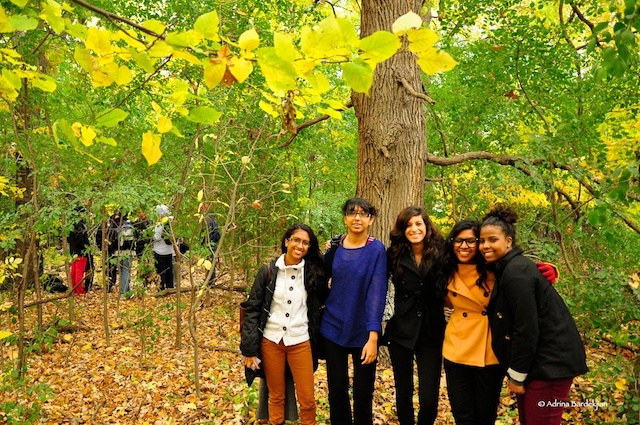 Given the role that the woodlot has played in providing students with an enriched educational experience, many thought that the notion of it as an obstacle was buried. Yet, it is now threatened by a new development. In October 2012, at the Western edge of the woodlot, lied the stumps of over 250 trees, like graves marking the unwilling retreat of the forest. To the chagrin of many faculty and students, these trees were removed to make way for a huge sports stadium, a commitment of the university to support the 2015 Pan American Games Stadium which will be held in Toronto. The university managers claim that they have lived up to the promise that there has been no impact on the Boyer Woodlot as a result of the building of the stadium because the cut trees were outside the Tree Protection Zone. Faculty members who use the woodlots as outdoor classrooms feel very differently and have expressed concern over the cut. Ecologically, they claim, the imposition may create an edge effect, subjecting interior forest trees to potential damage. Vegetation may die back, wildlife may retreat and soils may be subject to erosion. There is contention with regards to management decisions. The woodlots have transformed from mere forest remnants standing in the way of development, to places that must be tended, signed, and policed. Management options do, however, vary. Goals of strategic management planning depend on the intentions for how the space is used. Whose needs take precedence? A snag falls in the forest and becomes a home for various insects and ground crawlers. Should it be removed to keep the forest safe from tripping hazards? Do humans who frequent the woodlots at leisure take precedence over flora and fauna who need them as a habitat for nesting sites and subsistence? 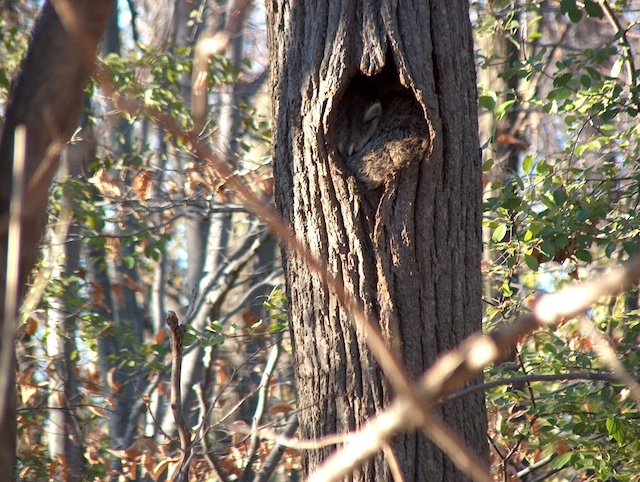 As a critical part of the ecosystem, for example, the woodlot is part of a migratory corridor for animals such as rabbits, groundhogs and increasing numbers of deer. During the first week of October, migrating birds use the place as a hotel. At one point, a family of geese nested in the courtyard of one of the adjacent buildings but then, as the goslings were hatched, they were escorted by university staff to the Woodlot’s pond. The building is now gone, a victim of a re-development, but the movement of the goslings from the courtyard to the pond is forever captured on You Tube. As part of the larger dominant environmental preservation narrative, there are many management options for the woodlots. One applies to the conservation of native species and the threat of exotics, such as garlic mustard that threatens to destroy many native species. Should garlic mustard be eradicated and, if so, how? Another management issue pertains to the woodlots as habitat for mosquitoes spreading the West Nile virus. In past years, the site was riddled with signs for pesticide application. Now the signs are gone but if the threat of West Nile comes back, the spraying will most likely restart. What implications would this have on the human and non-human patrons of the woodlot? Is spraying good or detrimental to both the site and the people who use it? On the one hand it is argued that the virus can be fatal to humans. But what about the negative impact of the spray itself? Do the benefits outweigh the potential costs? In the context of yet another management option, the woodlots are seen as places that must be held accountable and yield benefits such as sequestering carbon, providing shade; as ‘green infrastructure’ and ‘natural capital’ (McPherson 1994; Nowak 1994; Ulrich and Parsons 1992; Sorte 1995; Grahn and Stigsdotter 2003; Royal et al. 2009; Kuo 2003). The woodlots are also expected to bring exposure and monetary value to the university. 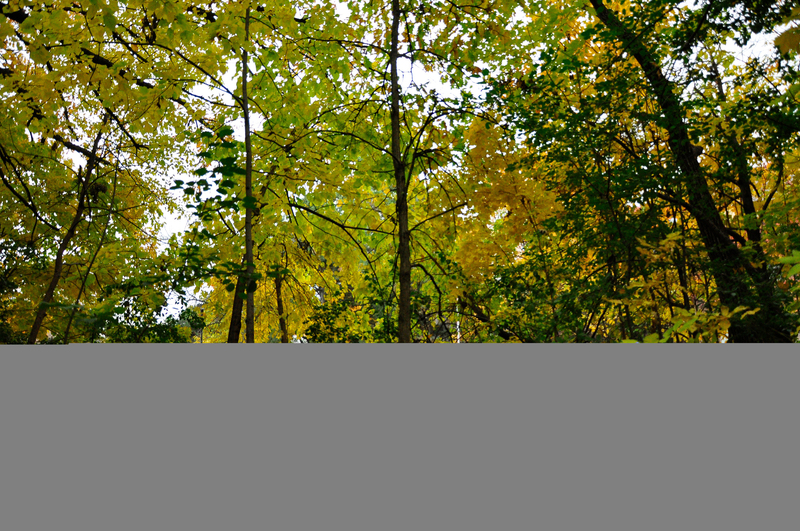 Students’ photos of the Boyer Woodlot are part of Fall Wallpaper Packs made to brand and market the university. And one of the services that York offers is a Commemorative Tree Program; for a price, the university will plant a tree or cluster of trees to commemorate individuals or an event. The manager’s eye sees the Boyer woodlot as an object of strategization, measurement, calculation, consumption and construction. The woodlot as a place for management and as a place of social interaction are now seemingly separate. The Arboretum Committee, which contained both managers and academics, has folded as a result of a decline in interest and the erosion of funds. Here stands the Michael Boyer Woodlot, a majestic place, yet the centre of a heated debate on the university development agenda. In many of our narratives about natural spaces, the economic driver and our need to continually develop space is prevalent. Yet, regardless of human interventions and the new ways we create space in a modern world, fundamentally, the forest has been a place of spiritual ritual and longing, a place of community and a home for non-human actors. Forests and trees were once iconized as gods, and revered. Trees are place-makers of culture, time and space, living through generations. Essentially we are still driven by the same things—the desire to connect with the land and connect with each other. Is there anything “natural” about the Michael Boyer woodlot? How can the woodlots be managed effectively given the diverse intentions for usage? 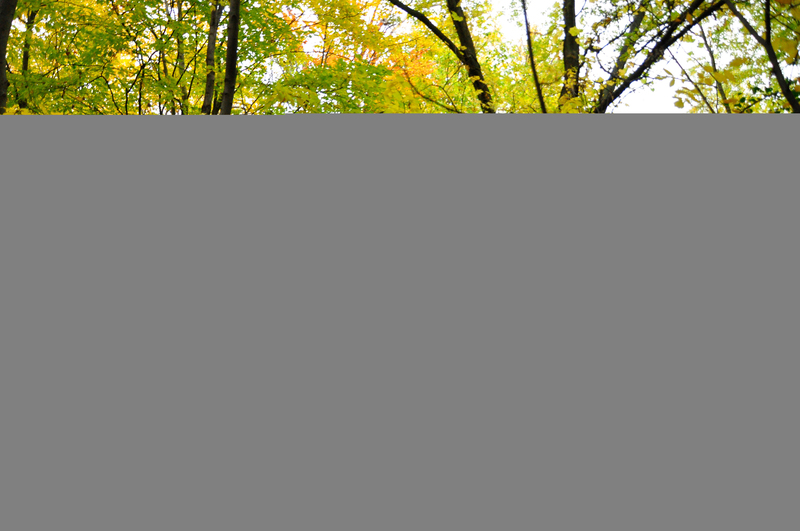 What are some ways in which we can help the woodlots continue to provide ecological value and enrich the lives of campus-dwellers, both human and non-human? How can this space be more enjoyable or usable to you? Is this even important to you as a visitor? How can using artistic expression (through sculpture and performance) in the woodlots raise awareness about urban forests? How does development and fragmentation impact the woodlots as green corridors? Boyer M, Hough M, Furedy C (1986) Environmental Conservation 13(3):263-265. Cronon, W (1992) “A Place for Stories: Nature, History and Narrative.” Journal of American History 4 78:1347-1376. Foster J, Sandberg LA (2004) Friends or foe? “Invasive species and public green space in Toronto.” Geographical Review 94(2):178-198. Grahn, Paul, and Ulrika Stigsdotter. “Landscape Planning and Stress.” Urban Forestry & Urban Greening 2 (2003): 1-18. Kuo, Francis E. 2003. “The role of arboriculture in a healthy social ecology.” Journal of Arboriculture 29 (3): 148-155. Morancho, A. B. 2003. “A hedonic valuation of urban green areas.” Landscape and Urban Planning. 66, 35-41. DOI: 10.1016/S0169-2046(03)00093-8. Sorte, G. “The Value of Nature and Green Spaces to the Urban Resident. Homo Urbaniensis.” Ecological aspects of green areas in urban environments (1995): 3-8. Thorsnes P. 2002. “The Value of a suburban forest preserve: Estimates from sales of Vacant residential building lots” Land Economics 78(3): 426-441. Adrina Bardekjian is a PhD Candidate (ABD) at the Faculty of Environmental Studies at York University in Toronto. Her research centers on exploring and communicating different stories, views and perceptions (or narratives) of the urban forest with respect to policies, practices and representations, and the social-psychology surrounding human behaviour towards urban green spaces and arboriculture. A strategist and creative thinker, Adrina’s work incorporates creative representations and outputs in contemporary photography, film and literature. Adrina holds a Bachelor of Arts in Creative Writing and Anthropology from Concordia University and a Master of Forest Conservation from the Faculty of Forestry, University of Toronto. She is a researcher, writer and educator, and works with a number of organizations on a diversity of projects and initiatives. A large component of her applied work has focused on school ground greening, educational resource development and strategic urban forest management planning. For more information, please visit www.adrina.ca.